LED Digital Stopwatch Timer List : Large - Small - All Sizes! Explore Seiko, Ultrak, and our Electronics USA LED Stopwatches. Quality Precision Timing at its Best! Easy to use and Count Up only - displays Hrs. Mins. Secs. This is a simple to use digital stopwatch timer that keeps track of elapsed time. It only counts up, with a maximum hour count time display of 99 hours. The CK-350 uses a reliable and very rugged heavy duty two button remote control that is built to last . It's perfect for basic timing tasks in industrial and commercial applications. Operation is simple and uncomplicated, with nothing to learn and no menus to deal with. It's ready to use right out of the box! This is a nice electronic bench top digital stopwatch timer, with an input port on the back for the optional remote control or external triggering. Great for industrial timing applications in factories and labs. World renown high quality and reliability - professional grade! Seiko athletic multi functional stopwatches are well known for their legendary quality and reliability. ElectronicsUSA.com is proud to be an authorized dealer for these great Seiko timing products! These are in wide use among sports coaches, and industry as well. Visit our new page of outstanding Seiko printing stopwatch timers! Authorized Dealer for Ultrak and Seiko Stopwatch products! Affordably priced 400 series professional Ultrak digital stopwatch timers are used worldwide and are known for their quality and reliability. We feel these are absolutely the best value on the market today. These are widely used from timing sporting events to industrial applications. We offer a nice and complete selection of Ultrak brand small digital timers. These are very handy to have around for timing basic everyday tasks in your home, office, school, factory, or wherever a small timer is needed. They are very simple and intuitive to operate. There's always a need to time something - these pocket timers do a great job! Check out our nice selection of these budget priced 300 series Ultrak digital stopwatch timer products. These have features and capabilities for what you really need during timing events. They're neither flashy or expensive - they just work well! These small handheld timers by Ultrak are very affordably priced, and are perfect for timing sports and special events. 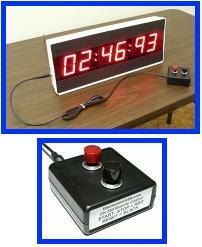 This is a high reliability commercial grade count up timer that displays elapsed time only. It counts up in hours, minutes, and seconds, and is not settable. The button switches on the top are very rugged and built to last! The CK-36 is often chosen for use in industrial and health care applications because of its easy of use and great simplicity. A great classic style analog display! We specialize in electronic time products, but this is perfect for those who prefer the look, sound, and feel of a traditional mechanical timer. Includes a digital stopwatch timer, calculator, and 12 inch side edge ruler, all integrated nicely as part of the clipboard itself. Good design! The Ultrak 700 is extremely useful for busy people who have a need to measure, record, calculate, and document timed events. Great for use in factories and industrial plants, hospitals and medical fields, and sporting activities. You can find the CK-3000 in use throughout business and industry! It's useful for various timing activities, and can count up to or down from 99 hours. It is so easy to use, you will never need to consult the instruction manual. With no complex display menus to mess with, the CK-3000 is totally intuitive. Switching between count up and countdown stopwatch timer modes is a breeze, and it's very simple to set. The CK-3000 wired remote includes time set buttons, start - stop, reset, and clear to zero controls. Collectible and cool mini LED display timers! Ruggedly built, and fully tested in used condition. Electronics USA has acquired a limited quantity of early handheld electronic stopwatches. We have a few from Cronus and other brands for those who enjoy these unique technology collectibles.